As one of the most prestigious sites we’ve had the opportunity to work on, we took great care in adapting Stanford’s design ideas into an easily updatable live site, where events content is highlighted through text and images in a number of different areas. Those who update the site fill out custom fields for event title, date, and summary, and the site cranks out the info in various sizes and formats depending on the page visitors are looking at. 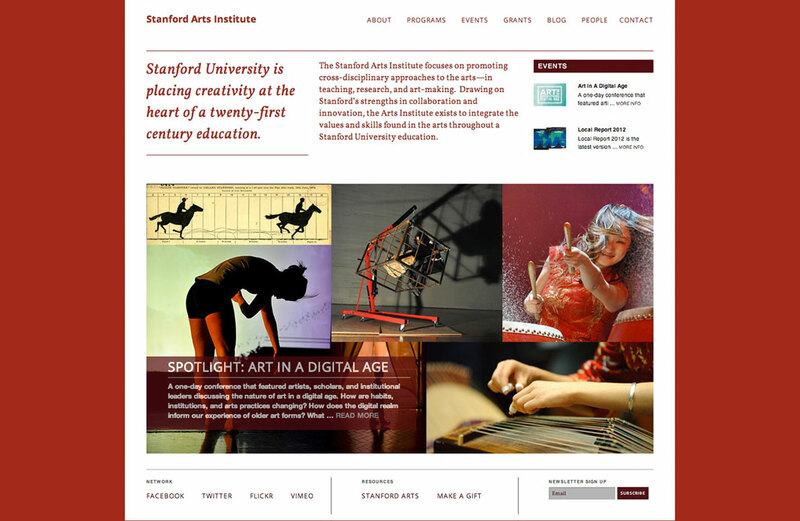 The Stanford Arts Institute focuses on promoting cross-disciplinary approaches to the arts—in teaching, research, and art-making. Drawing on Stanford’s strengths in collaboration and innovation, the Arts Institute exists to integrate the values and skills found in the arts throughout a Stanford University education.